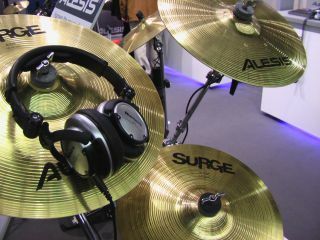 You might remember Alesis' Surge "feel like the real thing" electronic cymbals popping up a few times this year. Launched at NAMM as part of the DM5 and USB Pro Kit and re-launched at Musikmesse as a separate entity and combination pack, they are now - finally - shipping. The specs haven't changed, but to re-cap, we're looking at lathed brass cymbals coated with a clear layer of vinyl for a realistic look, feel and response. You can hook them up to your sound module via 'piezo' triggers.